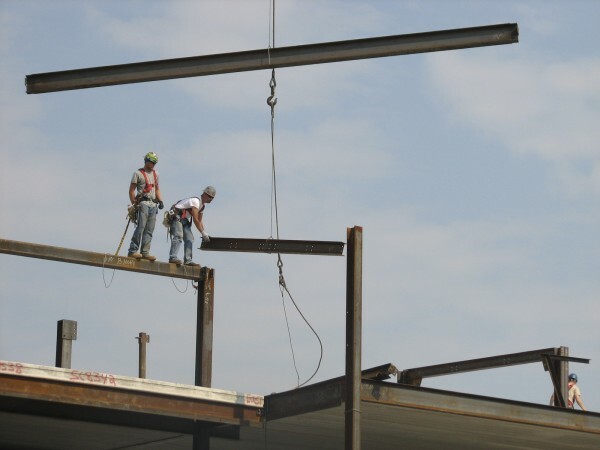 Steelworkers with Brewer-based Arc Erecting set beams into place Wednesday, Sept. 14, 2011, on a 102-room Ocean Properties hotel under construction on West Street in Bar Harbor. The workers and Ocean Properties officials held a "topping off" ceremony Wednesday to mark the placement of the last remaining piece of structural steel in the building, which is expected to be completed by June 2012. BAR HARBOR, Maine — Amid the post-Labor Day tourists and cruise ship passengers that are still crowding in the downtown village, there’s a lot of construction under way on West Street. On Wednesday, steelworkers and Ocean Properties officials marked a milestone in one of those projects when the final piece of structural steel was set in place on a $12 million hotel under construction on the south side of West Street, overlooking the harbor. The firm, which in recent years has acquired many of the commercial properties at the eastern end of West Street, hopes to open the new hotel in June 2012. The name of the 102-room hotel, appropriately enough, will be West Street Hotel, the resort firm announced Wednesday. Eben Salvatore, the company’s director of operations for Mount Desert Island, said Wednesday that when Ocean Properties renovated the Bar Harbor Club and opened the adjacent Harborside Hotel across the street roughly a decade ago, the firm found that there was a high demand for waterfront lodging. He said there is a variety of commercial lodging in Bar Harbor, but there is room for another high-end luxury hotel. To mark the placement of the last piece of steel, a brief “topping off” ceremony was held at noon. Steelworkers with Brewer-based Arc Erecting signed the beam, painted white, and fastened an American flag, a small fir tree, and a broom to the beam before it was hoisted into place. Mike Hopkins of Dixmont, foreman of the Arc Erecting crew on the project, said the tree represents growth. The broom, he said, symbolizes a “clean sweep,” which is another way of noting that no steelworkers were injured erecting the hotel’s frame. Hopkins said his crew of 12 to 15 men likely will be on the job for another few weeks putting all the floor decking in place. But without any more heavy hoisting to do, he said, the large red crane that has been visible along the waterfront for most of the summer will be removed from the site. Another project, also for Ocean Properties, is the renovation of the former Golden Anchor Pier across the street near the Harborside Hotel and Marina. That project involves building a waterfront boardwalk, setting five retail sheds in place along the boardwalk, building four luxury rooms on the site of the pier’s former restaurant, and erecting a footbridge across an inlet of water between the pier and another where Stewman’s Downtown restaurant is located. Ocean Properties rebuilt the Stewman’s pier and restaurant last year. Salvatore said that after nearly 10 years of shifting plans for the pier, he is glad the company is now redeveloping it. He said Ocean Properties is taking applications from retailers who would like to operate shops in the sheds. “We want it done, turn-key ready to move in for a springtime opening,” Salvatore said.